how does this look for an event card? I'm starting concept phase on a card for a cancer fundraiser whose inspiration is a violinist in a metal band that recently kicked cancer. I'm really liking where it's going. I know that I need to work on fonts, especially the Hope Eternal one. The flaming treble clef is a little busy, I like something there flaming I just need to find the right image to put there. I need to get the lineup as well as additional ad copy and I can make the back of it. I seem to be doing a lot of cancer charity gigs this year, you all should come out to Darq this Saturday in Salem for the North Shore Medical Center Cancer fundraiser. We have a whole lot of amazing local DJ talent and I'm bringing out a lot of my gear to make it all sound amazing. Everything we bring in for the night is getting donated. 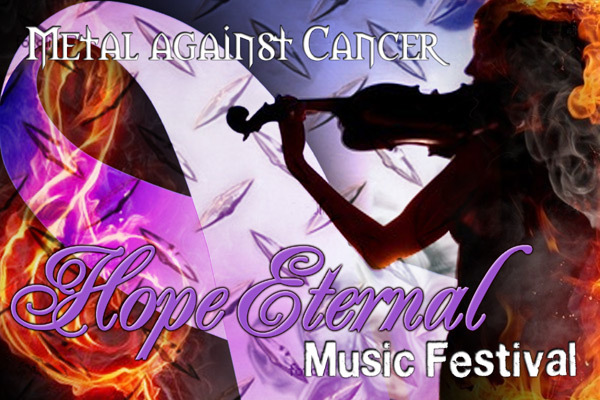 I find the "metal against cancer" text to be a bit hard to read cleanly; maybe fonts will take care of that, or maybe you want to fiddle with the colors a little. I like this, but I think the flames are a bit too much. Just got authorization on the card layout. They actually want more flames ;) I was kind of surprised that they want to drop the diamond plate texture. It's the only thing that says "metal" in the design. Oh, the irony! I really liked the diamond plate texture. Very clever with the whole metal thing, I thought.